What does PCR mean? Well, literally what it means is Polymerase Chain Reaction. What it really means to you (the consumer) is a warm and cozy feeling, a blanket of protection if you will. The knowledge that the beer you are about to enjoy is surely free of unwanted flavors that are produced by the bacteria that can inhabit beer. PCR is nothing new. It was developed in 1983. What is new is the technology that allows small independent beer producers to utilize the technique. This allows us to test beer for very specific organisms very quickly and in an affordable manner. Before this was as accessible as it is, the technique most breweries use/used is plating. Plating takes days and by the time you see results, product has moved on. PCR allows us to have accurate results in three hours. What is PCR? 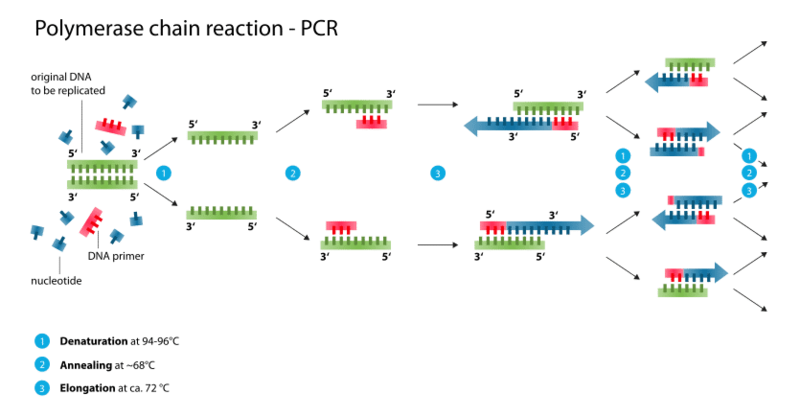 PCR is a method developed for molecular biology where a particular DNA segment is copied a verifiable buttload of times. This amplifies the particular sequence and allows for easy detection. This starting sequence can be specified, so we can look for one particular organism. One of the tests we utilize, we are testing for a sequence that is only found in hop-resistant pediococcus and lactobacillus. The image above shows the general steps for PCR. In reality, all these steps are simplified for us brewers by the testing manufacturer. I will go further into depth on them but I didn’t want you to think we were over here sequencing DNA and curing monkey diseases. Step 1 is denaturation. This is where a high heat is applied to break the hydrogen bonds between base pairs and essentially un-zip the DNA strand. Step 2 is annealing. This is when the DNA primer that has been supplied in a tube is allowed to bond with the sample DNA. Step 3 is elongation. This is where the nucleotides fill in the DNA sequence. These steps are repeated 20-40 times, resulting in an exponential increase of the desired sequence. Once sample prep is done, these steps are handled by a computer controlled thermocycler that cycles through all the proper temperatures. After all that we get to use these pregnancy test looking things that show whether our beer is free of the beer spoiling bacteria that can produce nasty flavors. The result of all this is simply confidence. Confidence that IHB and consumers can share. Confidence that our beer is free from unwanted bacteria. Used PCR ten years ago in microbiology. Amazing that it is available and being utilized for such an important procedure: beer brewing. I think the guy who developed the method was kind of cool too. I’d like to think that. In looking at the PCR test illustration above, I notice that the primers used in the far right only have a couple of links while the primers in the preceding pieces of the illustration have 3 links. I know that typically primers have more that 2 or 3 “links,” but is there some significance to the reduced (by 1) number shown? Also, the replicated pieces (again in the far right part) have a little red piece (some bigger and some smaller) stuck on the end of the blue (replicated) pieces. I only know enough to be dangerous but it seems odd. I thought all of the primer (pairs) were the same and didn’t change lengths. Can you please explain?